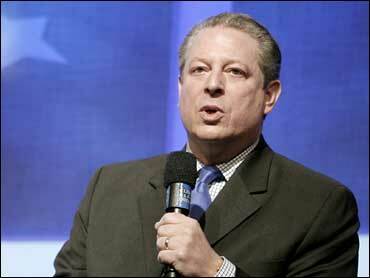 Climate change campaigners, including Al Gore, topped speculation about who would win the Nobel Peace Prize on Friday. The former vice president was nominated jointly with Canadian Inuit activist Sheila Watt-Cloutier by two Norwegian politicians. Nobel watchers and bookmakers say they are both good bets, as are the U.N.'s Intergovernmental Panel on Climate Change and its leader, Rajendra Pachauri. Others figuring high in the speculation included Finnish peace mediator Matti Ahtisaari, Vietnamese monk Thich Quang Do and Irena Sendler, who saved Jewish children in Poland during World War II. The five-member Norwegian committee that awards the Peace Prize works in secret, releasing only the number of candidates - 181 this year. "We stake our pride on keeping it secret," said Geir Lundestad, the committee's nonvoting secretary. Still, the names of some candidates are announced by those who proposed them. With only a few names to go on, speculation often is based on world events. This year, climate change was considered high on the international agenda. The U.N. climate panel has been releasing reports, talks are set to resume on a replacement for the Kyoto Protocol, and there is concern about the melting Arctic. Jan Egeland, a Norwegian peace mediator and former U.N. undersecretary for humanitarian affairs, called climate change more than an environmental issue. "It is a question of war and peace," said Egeland, now director of the Norwegian Institute of International Affairs in Oslo. "We're already seeing the first climate wars, in the Sahel belt of Africa." He said nomads and herders are in conflict with farmers because the changing climate has brought drought and a shortage of fertile lands. Egeland declined to guess who might win this year. However, he said, "sooner or later, there will be a climate prize." Stein Toennesson, director of the International Peace Research Institute in Oslo, said Gore and Watt-Cloutier, as well as the climate panel and its leader, could be a natural choice. Watt-Cloutier won Norway's Sophie Prize for the environment in 2005 for calling attention to the impact of climate change on the lives of the Arctic's indigenous peoples. Toennesson noted that Ahtisaari, Finland's former president, brokered a peace agreement for Indonesia's Aceh province and worked to negotiate a compromise on Kosovo. However, Dan Smith, secretary-general of the International Alert group in London, said he doubted Ahtisaari would be picked. "This is the year of climate change," said Smith. The committee often uses the prize to highlight a person or cause. Since Gore already had a high profile and an Oscar-winning film, "An Inconvenient Truth," Smith doubted he would get the prize "because he does not need it." But winning the prize would instantly renew speculation over whether Gore will enter his country's presidential election. A group of his supporters paid for a full-page ad in Wednesday's New York Times asking Gore to enter the race. "Winning a Nobel Peace Prize is a life changing event," Dylan Malone, who runs a Web site called AlGore.org, which advocates a Gore presidential run, told CBSNews.com's Brian Monotopoli. "If he wins (the Nobel), he will undoubtedly reassess the situation and think, 'Where do I go next?' He's done the slideshow, made the movie, won every accolade that our society has to give. There's nowhere else to go to take it to the next level in my mind." In recent years, the Norwegian committee has broadened its interpretation of peacemaking and disarmament efforts outlined by Swedish industrialist Alfred Nobel in creating the prize in his will. The Peace Prize, first awarded in 1901, now often recognizes efforts to foster human rights or democracy, to eliminate poverty, or to share resources and protect the environment. The Peace Prize is presented in Oslo while the Nobel prizes for medicine, chemistry, physics and economics are handed out in Stockholm, Sweden. The ceremonies are held Dec. 10, the anniversary of Nobel's death in 1896. The prizes include a gold medal, a diploma and a $1.5 million cash award. Even though Gore would not receive the prize for months if he were to win, speculation only increased Thursday after Gore dropped out of a fundraiser for Sen. Barbara Boxer, D-Calif., who, according to the San Francisco Chronicle, said Gore needed to travel abroad for an "exciting and urgent mission that could result in a major breakthrough in the fight against global warming."